…when I neglect my blog. The longer I go without posting something, the harder it is to think I have something to post. I start second guessing anything I might want to say, or any photos I might want to post and then more time goes by. I get out of practice. Then I feel like I should justify how I spent my time in the last month when I didn’t blog. Sheesh. I am my own worst critic. Life on this tiny island in Maine is crazy busy in May and June as we get ready for the summer rush of business, activities, friends, and family. I’ve been working in the studio, getting jewelry into galleries, weeding the perennial garden, planting some vegetables, spending time with my Mom, painting the bathroom, taking a two-day trip to NYC, and catching up with friends who have arrived for the summer. Who knows where the time goes. It just does. So, I’m jumping back into the blog pool and letting go of why I did or didn’t do it for over a month. 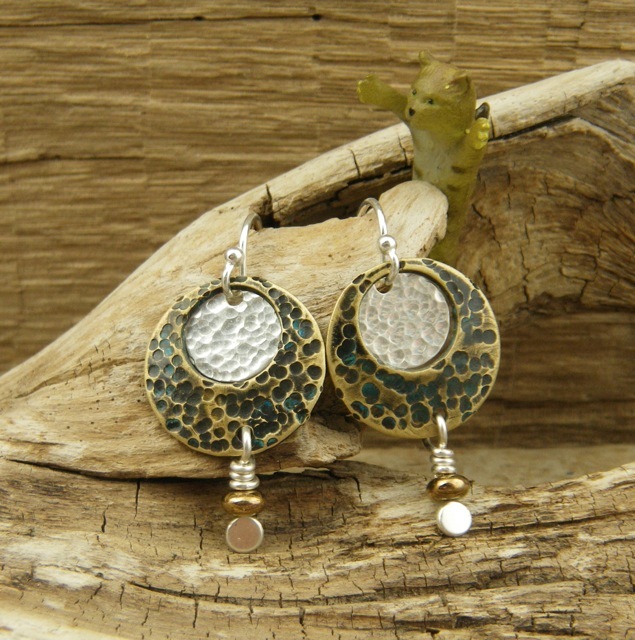 Part of my process in making jewelry is to make up a batch of components to mix and match in earring and necklace designs. 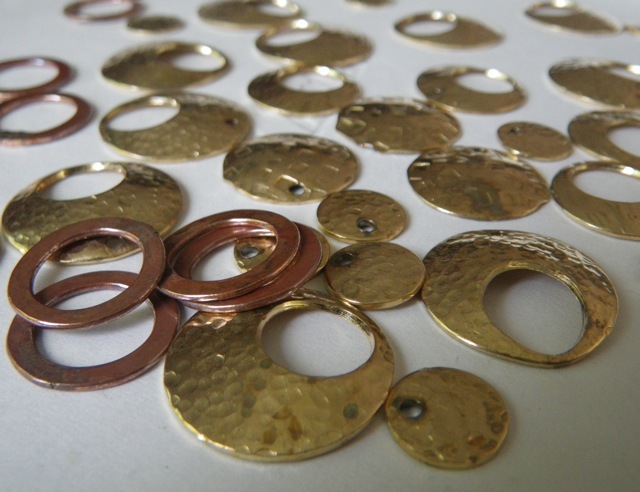 I cut, hammered, and tumbled some brass discs to get them ready for applying patina. 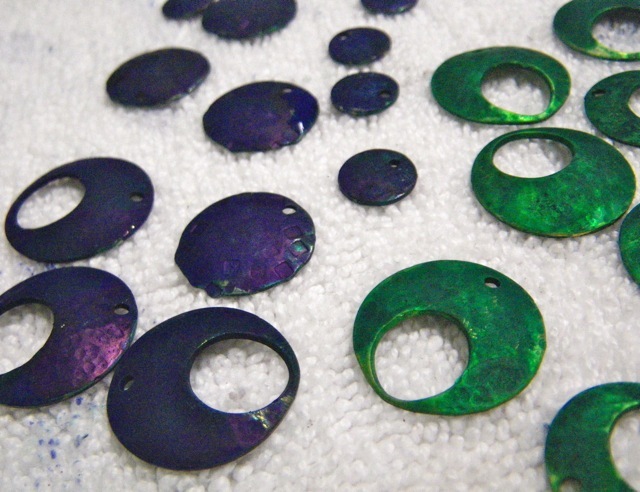 I also soldered some 14 gauge (it might be 16) copper wire rings and hammered them flat. Next I applied some patina solutions. 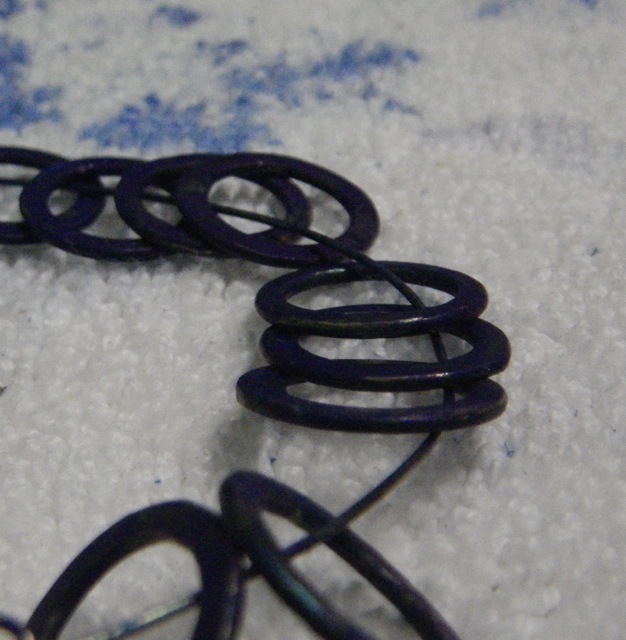 When they are sanded, sealed with lacquer, and finished with a preservation wax, they will be ready to use in earring designs like the one below. So that’s a little bit of what I’ve been up to. And, I’ve missed telling you about it.